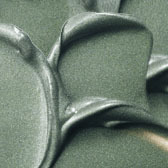 BEST FOR: Base color for more vibrant powdered shadows or as a “top coat” to add a little shimmer. QUICK REVIEW: Big expectations made Big Bounce a belly-flop – almost. 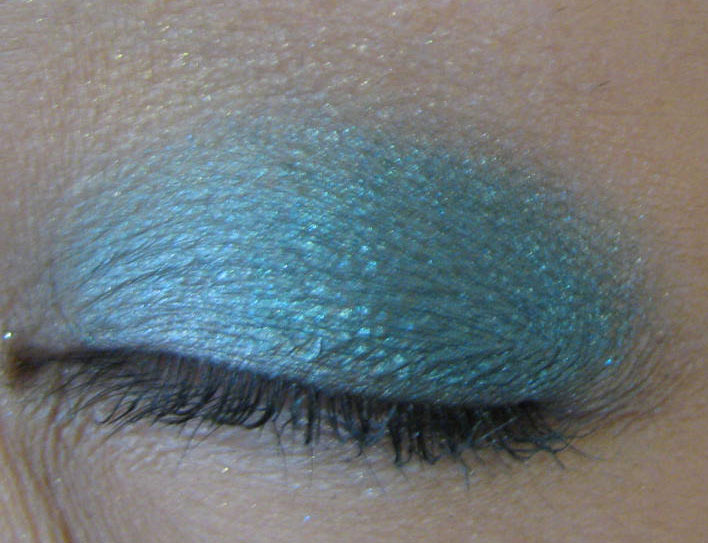 But it makes for a brilliant shadow base for color. the REVIEW(06/03/2011): Darn those great expectations. When I first saw M·A·C’s Big Bounce Shadows online – I thought they would be more like Awake Stardom Shimmer Glow Eye Jelly that has a spongy mousse-like texture and has a brilliantly shimmery finish with medium coverage. My Next Indulgence, described as a “forest green with blue & gold pearl”, was my first choice and was the shade Estee Lauder sent me to review (lucky me). The texture is more like a sheer gel and can be a little difficult to work with if you’re attempting a fuller coverage like I was. 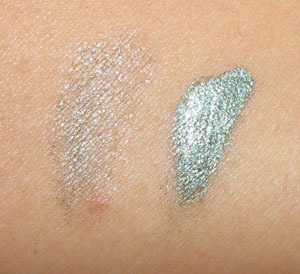 Here are some arm swatches with and without flash. My first few attempts in trying to build a more vibrant look left me frustrated. When applied to heavily, Big Bounce either disappears or gets splotchy. My impression was: lemon. Instead of tossing it aside for disappointing me initially, I decided to make lemonade. As you can see, it doesn’t have very much punch on its own. I tried several different methods of application – and found that using my fingertip was the easiest (as I have found with most cream/gel shadows). 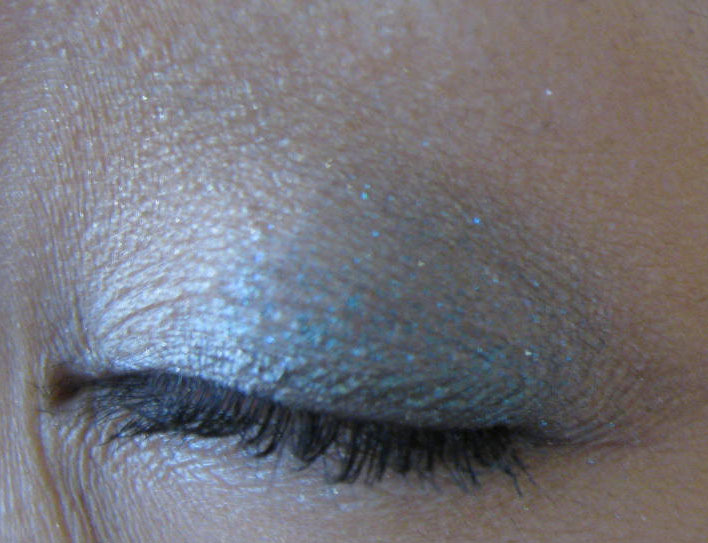 Still, trying to build coverage and intensity with Big Bounce Shadow was near impossible – so I decided to try it as a base under Shu Uemura ME Viridian (Filigree Collection – Fall 2006), a similar rich blue based metallic green. 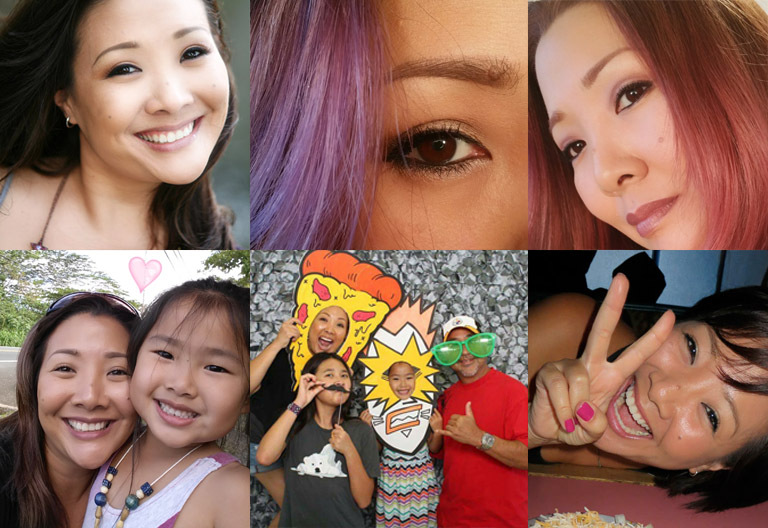 Please forgive my rudimentary application – I was just doing these photos for reference. As you can see, the area that has the Big Bounce Shadow is deeper, richer and did assist in creating a more dimensional metallic look. I created the look at the top of this post by using this technique and adding Shu Uemura ME Brass Gold (also from the Filigree collection), black eyeliner and a few clusters of Shu Uemura lashes that are similar to their Slim Partial ($13). 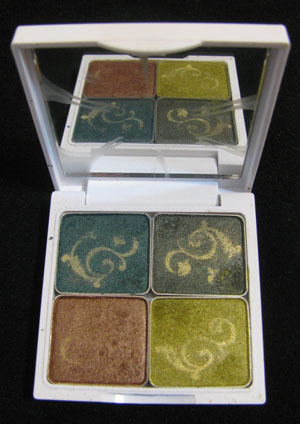 Shu Uemura Fall 2006 Filigree Collection Shadows: (Top L-R) – ME Viridian, ME Olive (Bottom L-R) ME Sepia, ME Brass Gold. There was also P Azure which was a pearled baby blue. the FINAL ROAR! : All my initial expectations aside, M·A·C’s Big Bounce Shadow in My Next Indulgence did help create a pretty parrot inspired eye – and increased the vibrancy and drama of the like colored shadows I applied over it. I’m not inspired to go out and buy every shade – although I would expect the lighter colors would create a lovely diaphanous glow for a softer look. M·A·C BIG BOUNCE SHADOW INGREDIENTS: Sorry, this information is not available at this time. Sources: maccosmetics.com. 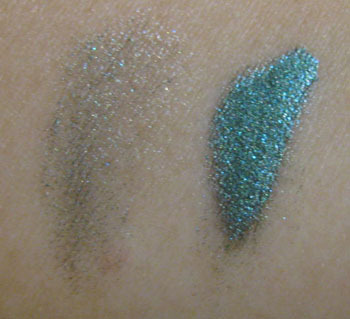 Product swatch and product images by M·A·C Cosmetics. Other photos by Cosmetic Monster. **This product was submitted by Estee Lauder International for review consideration. This is not an advertisement for this product. All reviews and information was gathered independently by Cosmetic Monster – and no compensation is received based on the outcome of this review.